Marie Luther is an artist who often visits a rambling creek and waterfall near her Syracuse home. “Sometimes I sit near the stream and listen to its melodic whispers and let the soft light that filters between the sugar maples stir my imagination,” she explains on her blog, Light Affects. 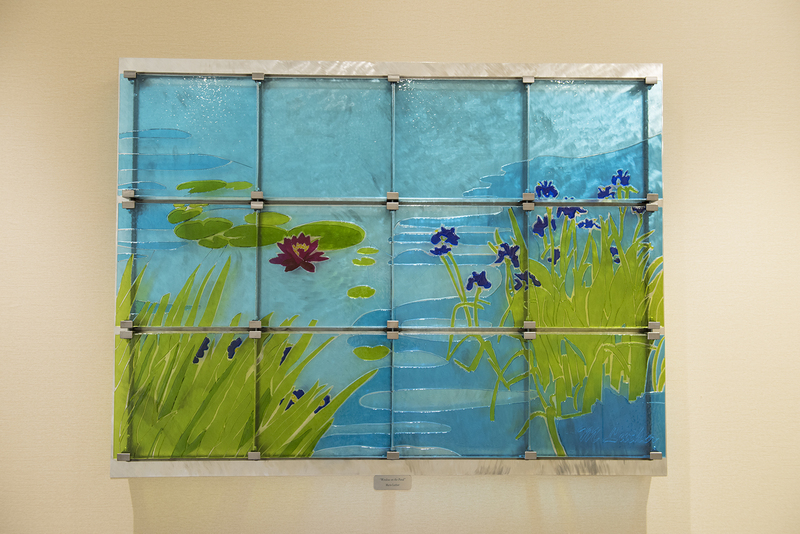 Visitors to the Upstate Cancer Center catch a glimpse of her tranquility when they see her 5-foot wide glass fused mural, “Window on the Pond.” It is located in the meditation room. The mural is one of the many pieces of art, including photographs, paintings and other works, created by 31 artists from Upstate New York that highlight the theme of nature being a refuge during cancer treatment. Many poets and artists are attracted to water because it can inspire the soul to find serenity, something Luther says she believed would be fitting in a cancer center.